Three Kings Sunday, or "Epiphany Sunday," just passed us last week. And these days, that that event tends to remind me of cats. Years ago, when I first got married, I inherited a couple of cats, and I (justifiably, in my opinion) hated them. I was raised with dogs and always thought of cats as sort of a fake pet, not really worthy of attention. In fact, I hate to say it now because they eventually grew on me, but in those days I spent a lot of time just making fun of them and putting them down in front of our friends and family. One Christmas Eve one year, some of our family came to visit, and among them was my little niece, Rachel. That night we had an early dinner (because I had to run off to the Christmas Eve service) and while we ate, I remember waxing unkindly about the useless felines that inhabited the house and Rachel was aghast. She had kittens of her own and she loved our cats, and here I was rudely telling unkind stories about them. After dinner we all went over to the church for the service, which was, of course, lovely. We sang and prayed and welcomed the Christ child into Bethlehem and into our hearts. I spoke of how amazing it was that God would choose Mary and Joseph for this miracle—two nearly-homeless and unmarried kids, from south Israel who were just coming through town to pay their taxes. Neither came from good families and neither ever amounted to much (Joseph probably died young because we never hear much about him again). But God always chooses the outcast, the denigrated, and the lowly to be the bearers of the Good News, and God chose them. So, there you have it. Paul, I told the late-night barely-awake crowd, says that the wisdom of the crucifixion is completely lost on the smart, the rich and the powerful. They just don’t get it. Those who do get it tend to be the ordinary people: fishermen, tax collectors, street people, or--as we used to say--“the least, the last, and the lost.” Today the world thinks it can function without a sense of the presence of the divine. It thinks that churches are dinosaurs and that all the joy and harmony that anyone needs can be found in buying a new HDTV or iPhone, or downloaded Taylor Swift MP3. But they’re wrong. The more we think we can be happy or fulfilled all by ourselves, by our own accomplishments, the more we misunderstand the bigger message of the birth of Jesus. That was my sermon that night. I’ve done better, but I thought it was okay. 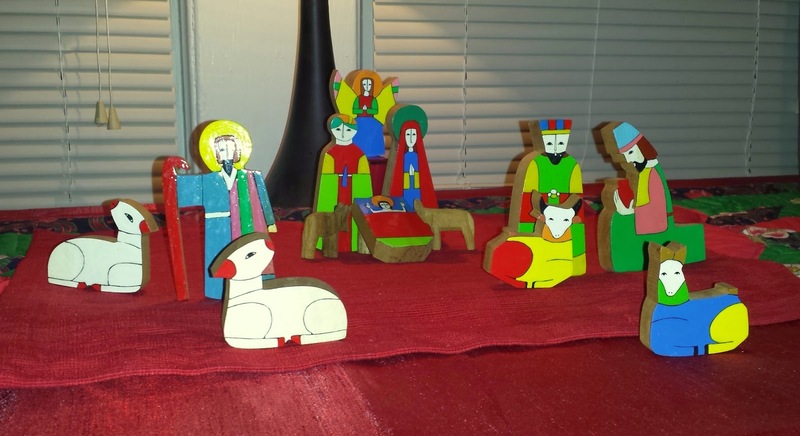 The next day when we were all gathered around the tree giving out presents in the name of the one who gave his all as a gift, I noticed something different about the lovely crèche on the sideboard in the living room that two of my parishioners had made for us. It just didn't look right somehow. We were busy all morning opening gifts and drinking coffee, but I kept glancing back over to the side board because something just seemed different. Eventually I began to realize that all of the animals had been turned around backwards. “Now what?” I thought. When we broke for a late morning brunch, I took a closer look and realized that everything had been changed. The donkeys and camels were now looking up and around into the room. The wise men were standing next to them pondering the sky or a star or whatever. Even the shepherds were now out at the edges of the manger peering intently away from the crib that should have been the center of attention. But when I looked more closely, I saw that not only had some things been moved, two or three new things had also been added. There, right next to the crib full of straw and the baby Jesus, were two little clay cats that we received as a gift some years earlier, which are normally kept in another room on a dresser. Someone had moved them into the stable and posed them to be looking right into the crib, with their little kitty noses almost touching the baby. What on earth had happened? I looked around for the culprit and caught little Rachel staring at me from the other side of the room and giggling uncontrollably. “What have you done,” I yelled smiling too, but trying to sound outraged. “I was just doing what you said,” she said. “Uh, sort of...” I said cautiously, not knowing exactly where this was going. And once again she giggled uncontrollably. And so, last week, that little conversation was on my mind again as we passed Epiphany and saw the visit of the so-called “Wise” men. The wisdom of the world seems increasingly dismissive of the wisdom of the cross. They (we) just don't get it. All of us who claim to be Christians, love to praise the baby in the manger as some symbol of peace and reconciliation, but then go about our business of lifting up the powerful and putting down the weak, of making the rich richer and the poor poorer.